There are so many baby products to choose from these days and I can't quite believe how much things have changed in just four years, which is when I had Sophie. 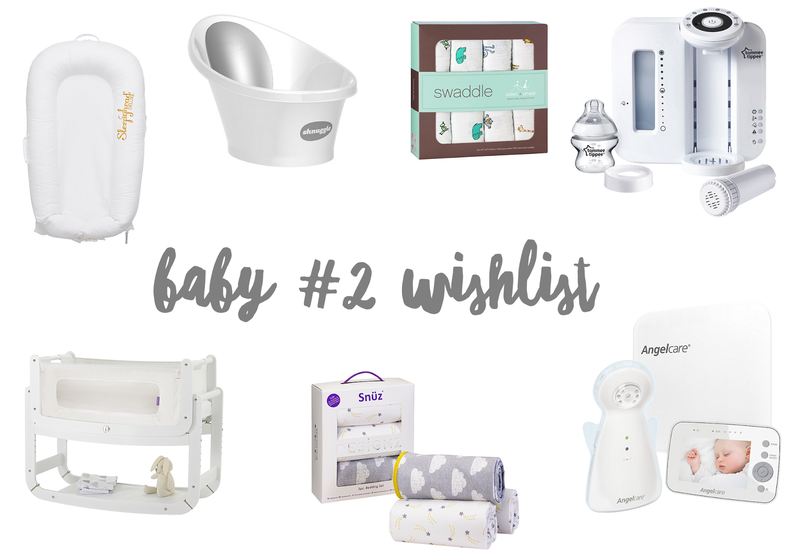 Since finding out we were expecting baby number two a couple of months ago, I have found myself browsing baby products everywhere I go! So I thought it would be fun to share some of the items I have found and put on my wishlist this time around! 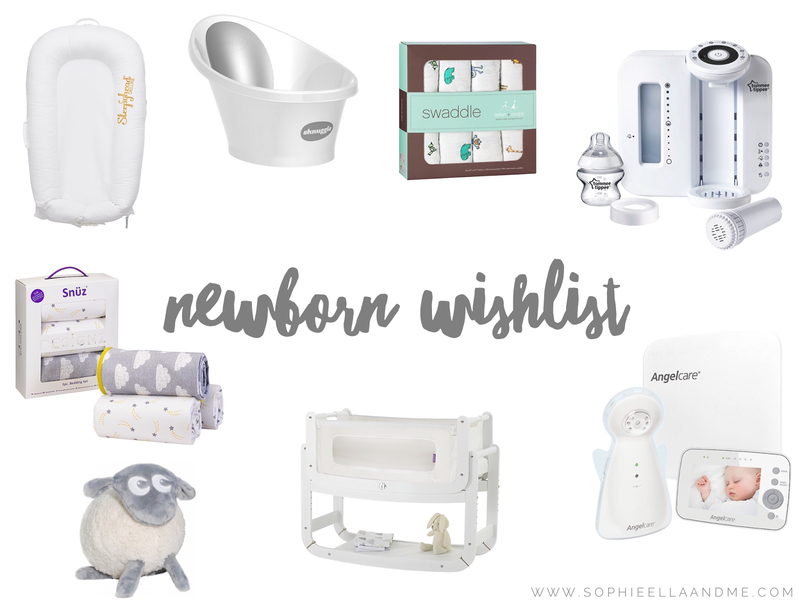 You've probably already seen the Sleepyhead pod before and I've heard so many great things about it, so it went straight on my wishlist for baby number two. Although it is pricey, if it helps baby to feel more secure, resulting in a better nights sleep for us all - then it's definitely worth it! I love the look of Shnuggle products and I think this will be so useful at bath time. It is suitable from birth - up to 12 months and it has a 'bum bump' for support as well as a foam backrest. I remember seeing these swaddles when Sophie was a baby, however I just couldn't justify the price of them at the time. Although looking back, I really wish I had purchased some as I know they would have been so useful for swaddling, mopping up spills and putting over the car seat or pram to shade her from the sun. They are made from breathable muslin material and get softer with every wash too. I'm in love with the 'Jungle Jam' prints, as well as their other products. I have already purchased this and I literally cannot wait to use it. It makes a fresh bottle at the perfect temperature in just 2 minutes and I'm sure it will be a lifesaver for the night feeds! I love the cloud design and think this would look gorgeous on the Snuzpod. The bedding set includes two fitted sheets and a reversible blanket. I think this is such a great product, as not only is Ewan a cuddly toy, but he also glows pink/red and plays soothing sounds to settle baby back to sleep. I really wish this was around when Sophie was a baby, as it may have helped her colic. This is something I have had my eye on for some time now. I love the design of the Snuzpod bedside crib and the features too. Although it's pricey, I think it's so worth it as it is bigger than a traditional moses basket, meaning it can be used until baby is around 6 months old. I will also keep hold of it, in case there's a chance we have a third baby in the future. I am a worrier and I think this would give me peace of mind when baby is sleeping. We can see the baby through the video monitor and the sensor pad monitors baby's movements. What are your newborn baby essentials? There are a few things on here that I wished were around when I had my two. Essential is a moses basket and lots a day lots muslin squares.